Canning  or "putting up"  vegetables is one of those traditional domestic skills that seems to have faded somewhat over the years. To be sure, modern technologies have ensured that it's no longer the only means of preserving food. But it's still one of the best  especially if you enjoy a good homemade pickle. 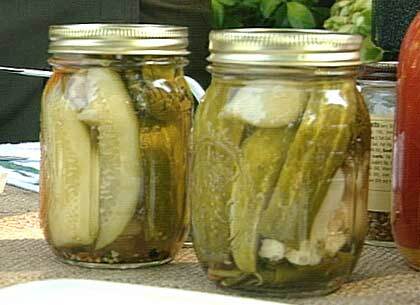 Read on for simple recipes you can use to make your own preserved and pickled veggies. Sterilize the jar by boiling it for 15 minutes. Place the jar sideways in boiling water, allowing the water to flow in. Place tomatoes in boiling water and let them sit for a few minutes until the skin splits. Cool in an ice bath. When they have cooled, core the tomatoes and slip the skin off. 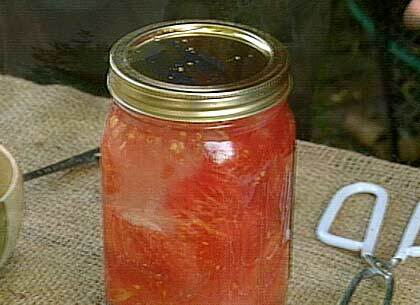 Fill the sterilized jar with the tomatoes, removing any air pockets. Be sure to leave 1/2 inch of space at the top of the jar (this is called the head space). Add the lemon juice and salt. Wipe the rim of the jar and heat the lid for a few seconds before sealing it to a medium tightness. Boil the filled jar for 45 minutes. Boil water, vinegar and salt to create the brine. Place 3 to 5 sprigs of dill and 1 to 2 grape leaves (to help your vegetables stay crisp) in the sterilized jar. Stuff jars loosely with vegetables. Add red pepper as desired for spicy pickles. Pour the boiling brine over the vegetables, leaving 1/2 inch of head space at the top of the jar. Wipe the rim of the jar and heat the lid for a few seconds before sealing. Boil the jar for 10 minutes. After boiling, be careful not to touch the lid. It will take 15 minutes for the jar to create a vacuum and seal itself. Pickles will be ready to eat in 6 weeks. This segment appears in show #2822.